It seems dangerous, but it's actually safer than the alternative. Year after year, we witness drones becoming more multifaceted in functionality. From artificial pollination to performing at halftime during the Super Bowl – drones have become just as diverse as the society that created them. This is now truer than ever, as China has recently equipped drones with flamethrowers for the benefit of the public. A power company in Xiangyang, China has established a hot, new way to clean power lines. Rather than having people try to reach the far corners of the city scraping off caked-on debris that’s been lodged in hard-to-reach-spots, the power company will now have drones perform this task. While this seems dangerous, the use of drones seems to actually be safer than the previous protocol. Before, maintenance workers would risk their lives to clean power lines, climbing upwards of 10 meters (32 feet) into the air while risking electrocution with each step. While the use of a flamethrower may require more frequent cable replacements, the metal power lines will not be harmed by the flames. 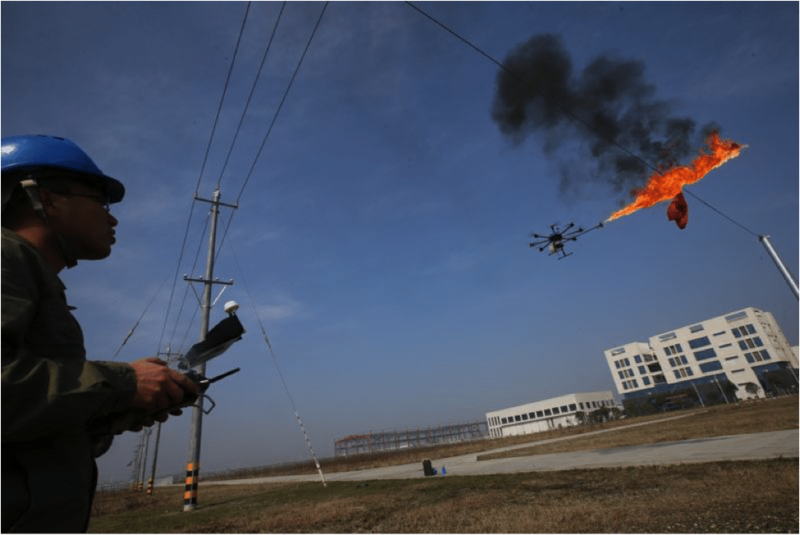 The 11kg drones have officially made their fiery debut, reminding us that while this might mean fewer maintenance jobs, technology, and flamethrowers, can improve safety.